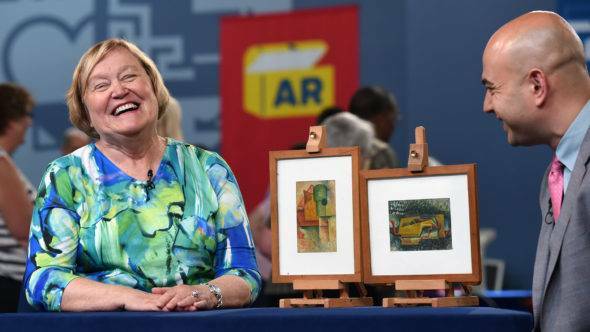 After more than 20 years searching for America’s hidden treasures, ANTIQUES ROADSHOW finds sensational first-time objects in six cities featured as part of season 22. From eyewitness accounts of historic moments to items that are truly macabre, ROADSHOW appraisers, guests and locations make this a ground-breaking new season. · In Harrisburg, Pennsylvania, a head in a box! A plaster head, that is, of a convicted bank robber who fashioned the prop to aid in his attempted prison escape. Harrisburg episodes will air January 21 and 28. · In New Orleans, Louisiana, a charming study of Andy Warhol painted by his friend, artist Jamie Wyeth, capturing Warhol with his beloved dog Archie. · In St. Louis, Missouri, a vintage Ozark Airlines poster, ca. 1960, featuring aircraft of the era and company logo illustrated through mid-century modern design. · In Portland, Oregon, an eyewitness account of the assassination of President Abraham Lincoln captured in a letter written by the guest’s grandfather, who was at Ford’s theater that fateful night and captured a most remarkable description of John Wilkes Booth. · In Green Bay, Wisconsin, a rare Cadillac “rain lamp,” ca. 1968, used to promote the famous auto brand through modern design and a unique mineral-oil-on-wire feature that simulated rain. · In Newport, Rhode Island, a one-of-a-kind 1939 Royal typewriter, plated by Cartier in 24k gold and presented to the guest’s grandfather, who was vice president of sales at Royal during the period. Newport episodes air in May. ANTIQUES ROADSHOW airs on Rhode Island PBS on Sundays at 8 p.m. More on the Newport episodes, including exclusive images from the event at Rosecliff mansion, coming later this spring!